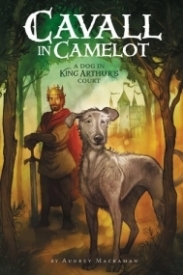 A DOG IN KING ARTHUR'S COURT is told from the point of view of a dog named Cavall. While out running with his brother Glessic, they run into King Arthur while he's out on a hunt. King Arthur is in need of a hunting dog, so he takes in Cavall. Cavall is so excited to have a person, but it isn't as easy as he thought it would be. In King Arthur's home, there are rules and Cavall must be on his best behavior to avoid embarrassing his person. He's lucky to have other dogs in the court to help show him the way. Cavall is happy his brother is with him too, but Glessic isn't as willing to have a person as Cavall is. As dangers present themselves, Cavall must be his best to protect his person at all costs. I love dogs and King Arthur and it was so much fun to read a story that combined the two. This one held my attention the whole time and I didn't think I would like it as much as I did because it was from a dog's POV. Instead, it's refreshing and different and I look forward to more books like this. Final Verdict: This book is perfect for fans of dogs, King Arthur, adventure, and standing up for what's right.